Newly discovered within the last decade, much of the vast interior of Mellarnia is still unknown. Mellarnia's pristine wilderness has yet to be exploited by those who live on Despair. -- Dragon Lake: The last mortal dragon came to this lake to die, and from his final breath a healing springs emerged. The guild of Healers has taken up residence in this remote area and may be your only hope of shelter in the entire region, should you become trapped on the continent. -- Hobgoblin Territory: Very few have entered this region and come back out to tell the tale. It is said that somewhere within these mountains lies the fabled Castle of Bone where the King of Goblins reigns supreme. -- The Royal Oak: A small, yet enterprising inn which has set up shop in the deep forest of Mellarnia. It does surprisingly well, as it is still one of the only safe havens within the land. -- Necropolis: A foreboding land within a ring of mountains where nothing lives. Nothing natural, that is, for this is the home of the dead. -- The ruins of Erend: Once the jewel of Mellarnia, there is now nothing but ruins left of this ancient city--ruins which some say are haunted. -- The Monks of Shao-Lin: Having moved to the mountains of this untamed continent, the monks have been left in relative peace to practice their arts under the leadership of Tang-Tu. -- The Benevolent Ocean: A calm waters, and the main reason why only the northern lands of Mellarnia have been populated, as the southern ocean shows little mercy to those who traverse it. -- The Ocean of Wrath: Second only to the Grief in deathtoll, the Ocean of Wrath is said to have a mind of its own. Even master sailors swear that it is as if something sinister beneath the waves here sinks almost every ship to pass the area with purposeful vengeance. -- The Silent Sea: As its name implies, this is a quiet body of water, surrounded on all sides by untouched wild lands. 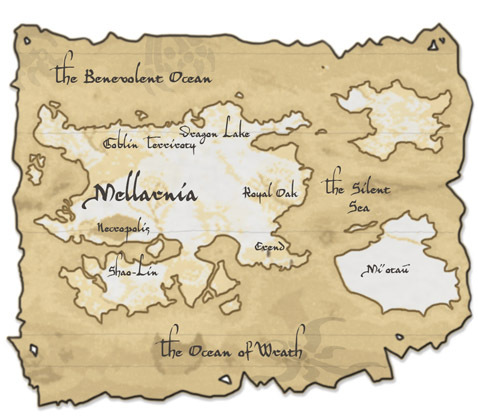 Rumours have it that on Mellarnia's eastern coast a small village exists, but most shrug this information aside as they would any old wives' tale. -- Mi'otau: The village of Mi'otau, the home of the Minotaurs. -- Unexplored Lands: The true frontier of the world. These twin subcontinents have barely even begun to be mapped or explored.